Sam So Guesthouse v Siem Reap, Kambodža: Zarezervujte nyní! 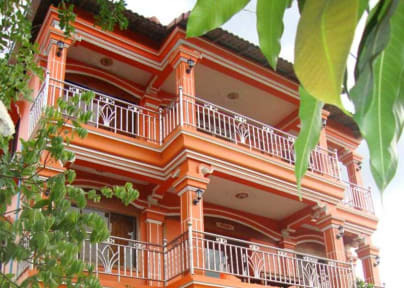 Our guesthouse is a Cambodian run family guesthouse. It is located in the center of Siem Reap city , very peaceful, relaxed atmosphere, very clean. Our staff are very friendly,honest , helpful and reliable. Our guesthouse has 19 rooms ( fan and A/C rooms). All room rates include breakfast,free wifi and free pick up. Each standard A/C room has a private bathroom (hot and cold water shower), cable TV with 80 channels and a fridge ,A/C, and Free WiFi inside. 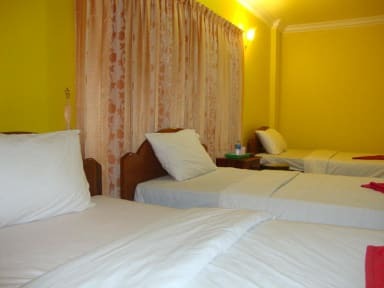 Each basic room with fan has private bathroom(cold water shower),cable TV with 80 channels, and Free WiFi inside. Free WiFi for all rooms ,Free internet at the lobby. We offer FREE Pick up from the bus station, airport or pier.If the guests would like to have free pick up ,they should inform our guesthouse about their arrival details at least one day (24 hours) before their arrival in Siem Reap. We're going to do our best to make your stay in Siem Reap in our guesthouse service enjoyable and unforgettable.We hope that you will enjoy your holiday in Siem Reap Angkor Cambodia by our service management.You will be satisfied with our Khmer hospitality services. We are always flexible : when we do not have many guests , we will let you stay until 17h00 ,you do not need to pay extra for late check out.